While visiting Reelfoot Lake in Tennessee recently, I stopped by a spot called “The Spillway.” There I met several guys bankfishing for one of the fish I love most to eat: the buffalo. These guys weren’t just fishing either; they were catching. They had a washtub in their truck full of buffalo fish from 5 pounds up to 35. Looked like they were having a great time, and I sure wished I’d had more time myself so I could have stayed and fished with them. 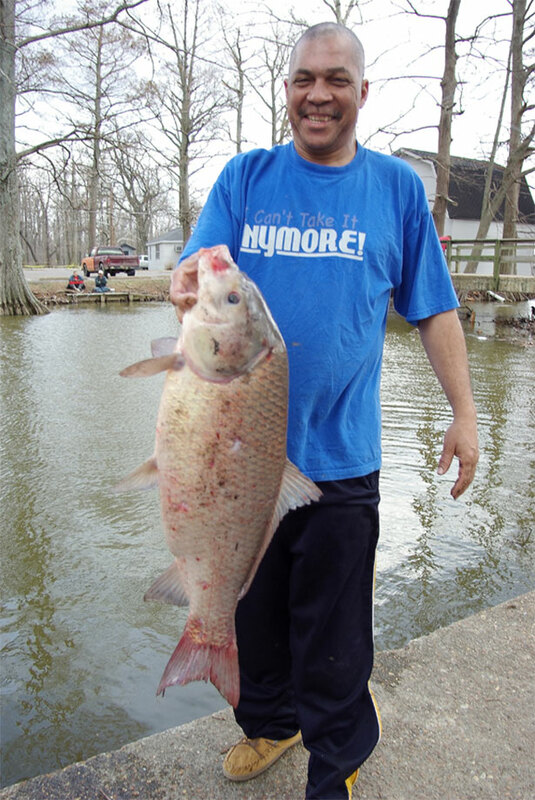 Buffalo fish are considered roughfish by most state fisheries departments, and that means in many waters you can catch and keep all you want. Few sport fishermen go after them, but commercial fishermen catch and sell millions of buffalos annually from big rivers and lakes throughout the Mississippi River Valley, a trend that has continued year after year after year, for more than a century. In fact, buffalo fish are, and always have been, among our nation’s most important wild food fishes. I guarantee you the guys I met at Reelfoot weren’t practicing catch and release on the monster buffalos they were landing. They were catching buffalos to eat. Considering how many buffalos are harvested each year, it might come as something of a surprise that so few people have ever sampled the delectable flesh of these fishes. Many buffalos are sold in riverside communities in the South where fried buffalo ribs long have been considered special delicacies. Some make their way to fish markets in New York, Chicago and other big cities. But ask a person you know if they’ve ever tried buffalo, and chances are they’ll tell you no. That’s a downright shame. The buffalos’ flaky white flesh, streaked with dark veins of sweet fat, embodies the rich wild essence of the great rivers from whence they come. All who proclaim them good to eat will tell you they are not just good; they are flat-out delicious. No other fish has a flavor that quite compares. 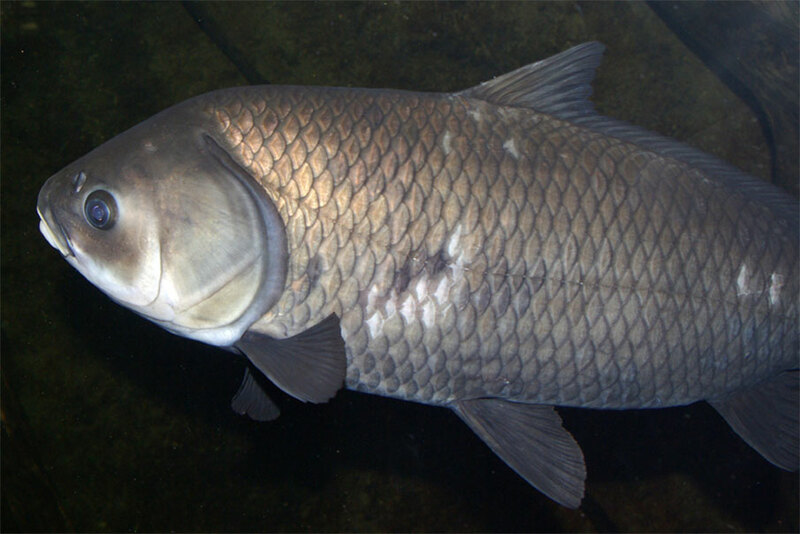 Three species—smallmouth, bigmouth and black—occur in our country’s waters. And some reach enormous sizes. When I was state fishing records coordinator for the state of Arkansas, I weighed in a 105-pound black buffalo taken by a bowfisherman and a 92.5-pounder caught on rod and reel. The fish are abundant in many waters, particularly big rivers, but catching them using “normal” fishing tactics can be a lesson in frustration. Because buffalos feed primarily on tiny water animals, they’re seldom tempted by anglers’ bait. They’re occasionally caught by accident on worms, crickets or jigs, but for more consistent success, those who actually fish for buffalos using rod and reel have a trick that helps them tempt these big bruisers. They bait a hole with livestock range cubes—hard, high-protein cubes used to supplement cattle feed that dissolve quickly in water. Buffalos are attracted to the odor of the dissolving cubes. If you want to try this method, go to your local farmer’s supply store and buy a sack of range cubes. They’re relatively inexpensive. When you reach your fishing area, broadcast several handfuls around the spot where you’ll fish. Good locales include the shallows of river backwaters and flats near tributary mouths. While the cubes dissolve, prepare an egg-sinker rig using a 1-ounce sinker, one size-7 barrel swivel and one No. 2 baitholder hook. Run your main line through the sinker, and tie it to the swivel. Make a hook leader by tying the hook to a 24-inch piece of monofilament. Tie the hook leader to the swivel’s free eye. Bait the hook with several small worms or pieces of whole-kernel corn. Cast the rig into the chummed area, let it sink to the bottom and then tighten the line to remove all slack. The rod is held in hand or braced against a forked stick stuck in the ground. The reel is free-spooled so biting fish feel no resistance, and so the angler doesn’t lose a rod to the quick run of a large fish. Line movement indicates a fish has found the bait. Usually, buffalos pick up the bait and start swimming away. When this happens, count to 10, set the hook hard and prepare for action. A hooked buffalo fights like a lassoed steer. If you want to eat the buffalos you catch, you’ll need to know the proper way to dress one. First “fleece” the large scales off the skin in a single layer with a sharp knife. Insert the knife just forward of the tail, then working toward the head with short sawing cuts, remove the scales along the side, leaving the skin intact. Unless it will be cooked whole, fillet the fish after fleecing it, cutting through the ribs to produce fillets with skin on one side and the ribs attached. Cut the rib section off each piece, and slice between the ribs, creating strips that each contain three or four ribs. Divide the remaining portion of each fillet into two long pieces by cutting lengthwise along the lateral line. Then remove the dark red meat along the lateral line portion of each piece. Score each piece across the grain at 1/8-inch intervals along the entire length, slicing to, but not through, the skin. This virtually eliminates the free-floating Y-bones when the meat is cooked. If you like, cut each scored fillet into smaller, serving-size pieces. You’re now ready to cook your buffalo, and the following recipe, my favorite, provides a delicious means of doing so. Combine milk, salt and pepper in a large bowl. Combine flour, cornmeal and paprika in a large zip-seal bag. Dip the buffalo ribs in the milk mixture, then place in the bag and shake to coat with the dry ingredients. Cook the ribs in peanut oil heated to 370 degrees in a deep fryer. 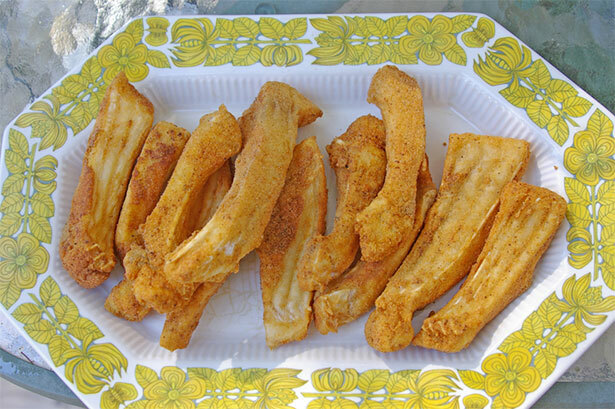 Cook until fish flakes easily when tested with a fork. If you catch lots of buffalo and have room for a guest at your dinner table, give me a shout and let me know when the feeding will start. When it comes to fish dishes, there’s nothing I like better than fried buffalo. See you there!